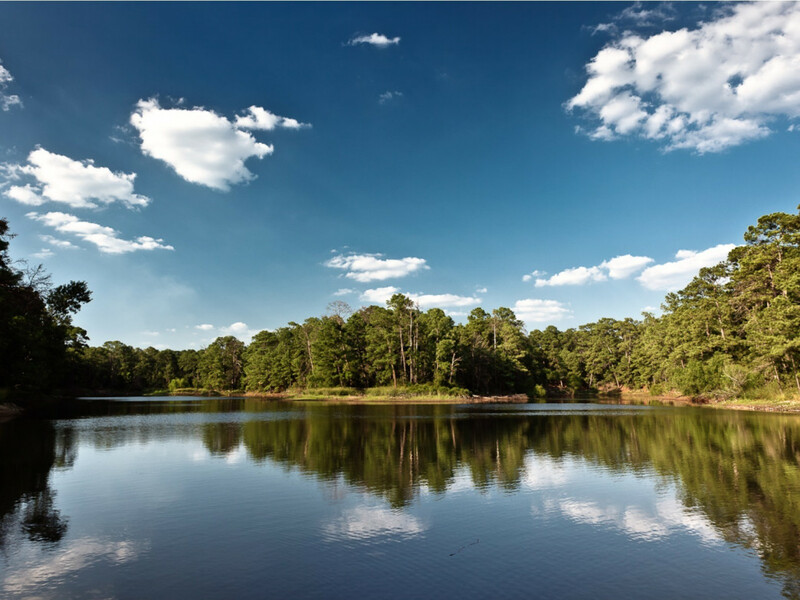 Bastrop Lake is located three miles northeast of Bastrop in Bastrop County, Texas, on Spicer Creek, a tributary of Piney Creek which is a tributary of the Colorado River. The lake is owned and operated by the Lower Colorado River Authority for cooling to the Sim Gideon Generating Station and recreational purposes. Authorized by Water Right Permit No. 2054 (Application No. 2265) dated May 6, 1963. Designed by Brown & Root, Inc., the dam was constructed by general contractor, H. B. Zachary & Co. from May 1963 to 1964. Deliberate impoundment of water started immediately followed completion in 1964. The dam is an earthfill embankment of 88 feet high and 4,500 feet long including the spillway. The top of the dam is at elevation of 458 feet above mean sea level. The spillway is located at the left end of the embankment and is a concrete ogee section with a crest at elevation 425 feet above mean sea level. The discharge is controlled by two taintor gates, measuring 45 feet long by 25 feet tall. The lake has a storage capacity of 16,590 acre-feet encompassing a surface area of 906 acres at the conservation pool elevation 450 feet above mean sea level. Although the dam controls only about 8.7 square miles drainage area, water has been pumped from the Colorado River in order to maintain a reasonable water level for cooling purposes.